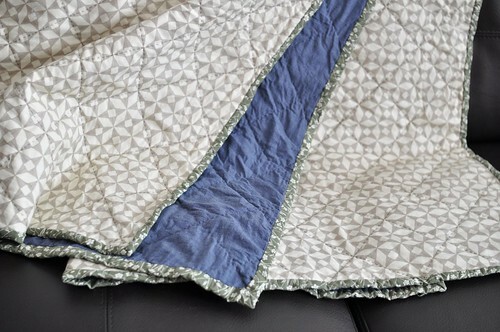 Yep, I’m firmly in the quilting camp now! I ordered a big cutting mat, new rotary cutting blades, a big ruler and other tidbits. Now I’m ready for some quilting on a larger scale. 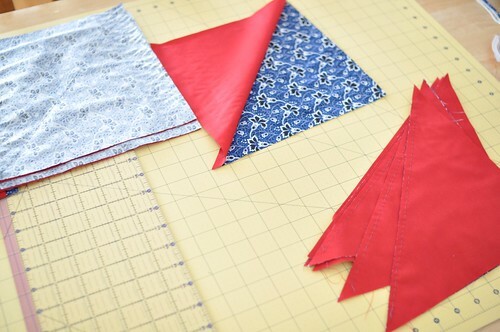 Last night I practiced cutting 10″ squares on some remnant fabric, then moved onto my “real” fabric. Cowboy colours chosen by my beloved, for his chevron quilt. Yep, I’m hand piecing. 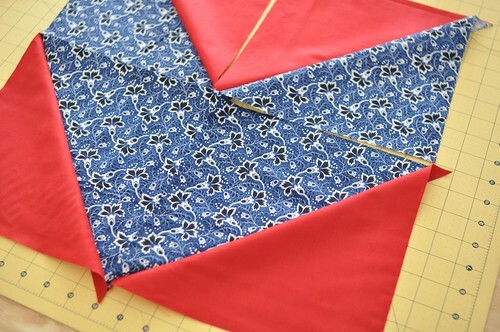 I thought about going down to the workroom and using a machine to make things faster, but I do really love the hand sewing – plus I was just too impatient and wanted to start right away. 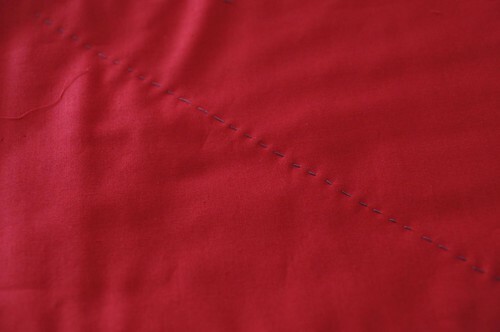 The HSTs are going pretty quickly, though I’m sure once I get onto the longer seams I might change my tune! 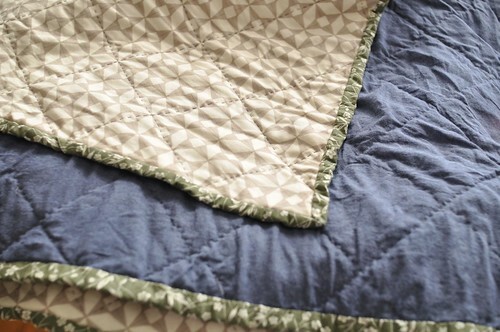 My quilt is all done, including its inaugural trip through the washing machine. I’ll be honest, I was expecting a seam or two to come undone, but it seems to be intact! 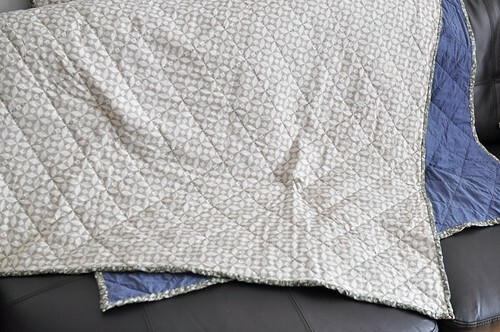 It isn’t the most photogenic quilt, but it feels great. Finished dimensions are about 40″ x 76″ / 102 x 193cm – so it’s narrow, but that’s what I was going for. Front fabric is from the workroom (I don’t remember what line it’s from though, oops), as well as the cotton batting. Back fabric is an old duvet cover from Ikea, and the binding is cotton from the Textile museum sale. 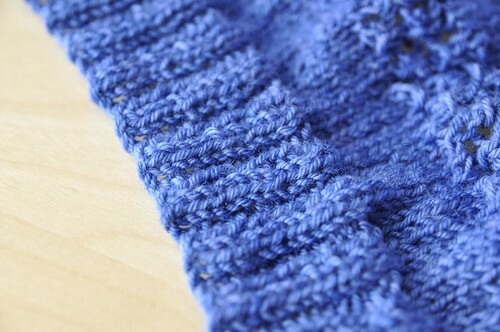 It was a really nice project to do, though the large pieces of fabric are certainly trickier to wrangle than my knitting! 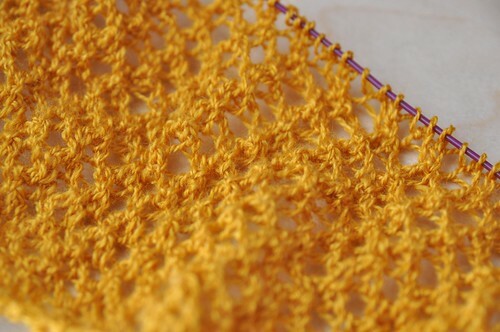 I’m really pleased with this one and I think for my next step I’m going to try some half square triangles. I’m still working away on a few new things for summer and lots of things for fall! But to tide you over, how about a summer sale? 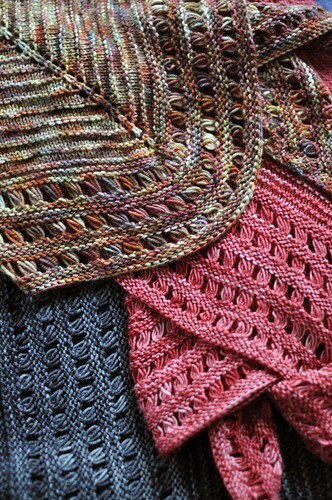 All my self-published patterns and ebooks are 25% off a total of $5 or more on Ravelry! No coupon code needed, the discount should be automagically applied to your Ravelry cart of $5 or more. Sale ends at 11.59pm EDT June 30, 2013.